The other day I had a problem with my new iPad. I headed to the Apple Store for the solution at the Genius Bar. I almost always have positive experiences at the Genius bar and I had no reason to believe this day would be any different. BTW, if it’s a bar, why don’t they serve liquor (consider that an official suggestion Mr. Tim Cook). The Genius ran some sort of diagnostics test and quickly determined there was some problem that was eating up my memory and causing things to fail. That puzzled me because the iPad is only two weeks old but I did move data over from my old iPad, so maybe some of the gremlins came along for the ride. The Genius said it was an easy fix and asked the question all IT people ask, “did you backup your data?” I am not new to this game so of course I had backed up my data. He verified that the last backup was a few hours prior and set about to erase and reset all settings. After this process he sent me home because I already knew how to upload all the apps – I didn’t need him for that. After all, I was programming in BASIC in high school in 1984, I think I can handle uploading an App. That said, I was a little disappointed as this is a process that takes a long time as numerous apps have to be re-uploaded, organized again the way I like them and where I can find them on my iPad, and then plenty of passwords and usernames added back in. But I just had a bad feeling. Something wasn’t right. When I got home I quickly realized I had lost all of my data, and that nothing had really backed up. Along with a lot of critical work information including pages of notes I had just taken for a client, I also lost some photos I’d taken on the iPad within the past few weeks. A couple of these photos were those “moment in time photos” that you want to keep forever and now they were gone. As I fumed and railed and got more and more pissed off, that not only was I going to have to rebuild the iPad, but I had lost tons and tons of data, years worth in fact, my wife reminded me it was time to read to the boys and get them to bed. Since I travel a lot this is one of routines that we almost always make sure we follow whenever I’m home but tonight the last thing I wanted to do was get involved in story time. I wanted to sit down with Mr. Cook and Apple, not Dr Seuss and a Cat in a Hat. 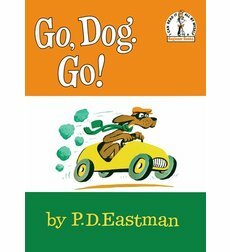 I grudgingly went into one of my son’s rooms and he handed me a copy of “Go Dog Go” by P.D. Eastman. It is a perennial favorite that I used to read to my daughter and my oldest son and now my youngest son was going through his phase. I got through the book but the entire time at the back of my mind I kept thinking about the iPad. Then I went into my older son’s room and picked up a Shark Wars series book (don’t’ ask), which we’ve been working on. Again, I really didn’t want to be reading the book and at the back of my mind the data problem kept percolating. After I read their stories and got them prayed and into bed I actually felt a little bit better, my mind a little bit more clear, and I had a few ideas about how to fix the data problem. It took about 10 minutes or so but I managed to recover the data including the photos and the notes. The iPad still has some problems so I know I will have to go through this process again, but this at least gives me the chance to transfer all the data to another device and really make sure it is backed up. I realize that as much as I did not want to go to engage in another activity, I wanted to stay focused on my problem, engaging in another activity allowed my mind to relax and think through, so I could find some solutions that my stress was not allowing it to find. I guess sometimes when you’re having a problem you just have to read Go Dog Go.